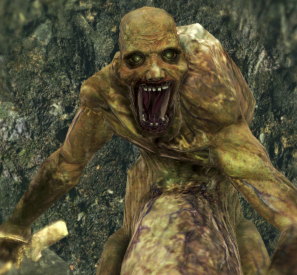 Forrest Grotesque is an enemy in Dark Souls 2. Goblins are humanoid creatures that lurk in the Shaded Woods. These deformed monstrosities give a grotesque impression and do not appear to be products of a natural evolution; rather they seem to have once been human. What twisted force could have rent their humanity and left them in this sad state…? Rush or bait their attacks and dodge/block and then dispatch. Ranged classes take out from range. Shoot : Shoots at the player when in range. Sword Slash + Fist Swing: When a player come into melee range, that archer will draw a sword and can swing at you with either hand. Why don&apos;t you guys mention their grab attack? It happened to me today for the first time in over 1500 hours of gameplay. They jump on you like the goblin things from dark souls 1 and bite your neck a bunch. It inflicts moderate damage but a lot of poison and bleed damage. I gave these guys the glorious name:*****Sack. The name has quite the fitting meaning in both English and German.